Journalism doesn't represent the point of view of the person reading or watching. This is the basic flaw of journalism today. It's all about point of view. I listened to a podcast yesterday at the recommendation of a friend. It's the story of a woman reporter for NPR talking about her experiences covering the presidential campaign, "as a Muslim." If you want the perspective from their point of view, watch this video of interviews with Trump voters before the election. You see where they live, how they relate to each other. It's remarkable how much of what they say are straight recitals of Trump talking points. This is one of the best things I've seen, heard or read about the election. A real eye-opener. It helped me understand how broken we are, as a country. Because it's not true that the country is for white people. That's just something people say. The NPR reporter was born in Indiana, speaks like all of us, she's American. But if Trump could so easily convince white people to fear Muslims, he could do it for any other race or ethnicity. Anyway, that's not exactly the point of this piece. First I wanted to establish that point of view is integral to what your truth is. If you're a Muslim reporter for NPR you see it from one point of view, and if you are a white person in Des Moines you see it a different way. 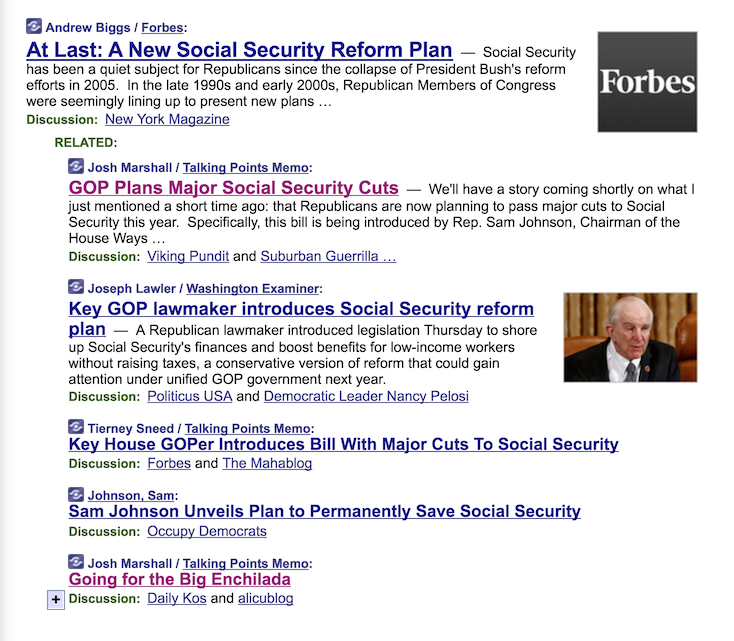 Look at this screen shot of current stories about the changes that Repubs want to make, right now, to Social Security. They're all from the point of view of who? Reporters, Washington insiders, and unfiltered Republican misdirection. Not represented is the point of view of a retired person in the Bronx or Sarasota or West Des Moines, who has paid into Social Security all their life and is now depending on the payments, and is going to lose them. For them the headline would be "Repubs want to take your Social Security." I think there's a good argument for changing take to steal. Maybe that's too much for a reporter to say. But it's not too much to put the cost to the reader/viewer up front. Imho that's where I believe it should be, must be, if you're doing your job. And the article should clearly explain how you can register your displeasure immediately and clearly. It's funny because I heard Megyn Kelly, also in a recent podcast, say that she reps the interests of her viewers. She sounded like she meant it. I like Megyn Kelly. I think she's sharp and she has courage. But I'm pretty sure Fox News isn't presenting the news from the viewer's perspective. They're probably running with the Republican myth that they're "saving" Social Security. In a sane world, reporters should be exposing the lie fully to their constituents and helping them act. And if it means cutting off a Republican spinmaster, all the better. This is a missing component of today's journalism, the point of view of the reader. If you all could focus more on that, the readers would take more interest in your product.